Be the first to share your favorite memory, photo or story of Kantaben. This memorial page is dedicated for family, friends and future generations to celebrate the life of their loved one. Kantaben Patel, 96, of Demol, India died Tuesday, March 19, 2019. She was born March 16, 1923 in Malataj, India and currently resided in Americus, GA. She enjoyed spending time with her family, enjoying walks in the garden while feeding peacocks, eating white chocolate, and laughing with her grandchildren. She had a great sense of humor that we all enjoyed. The family will receive friends from 6:00 p.m. to 8:00 p.m., Friday, March 22, 2019 at Greg Hancock Funeral Chapel in Americus. Funeral services will be private. 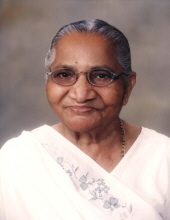 Her family included her four sons and four daughter in laws, Late Vinod and Daksha Patel, Ramesh and Sushila Patel, Bipin and Manjana Patel, Sharad and Ila Patel, and three daughters and three son in laws, Prafula and Chandulal Patel, Late Pratibha and Shasikant Patel, and Hasumati and Late Vinodkumar Patel; fourteen grandchildren and their spouses, Sunil, Reena, Late Dharmesh, Himesh, Veena, Sangeeta, late Dhiren, Nikki, Rakesh, Uday, Malini, Hitesh, Sarika, Bharvi, Hiteshkumar, Chirag, Meera, Mihir, Rinku, Sameet, Neesha, Survi, Tarang, Divya, Rushabh, and Jagruti; twenty-two great grandchildren, Monica, Rishi, Ravi, Sahil, Rishi, Sai, Milli, Shreya, Maya, Ishaan, Anaiya, Aarya, Bena, Avni, Anika, Rimi, Riaan, Aashiv, Aarav, Riya, and Niam. In lieu of flowers, please send contributions in her honor to Rosalynn Carter Institute for Caregiving at 800 GSW State University Dr. Americus, GA 31709. Caregiving is an important part of life and Kantaben had many, we want to make sure to appreciate them all. To send flowers or a remembrance gift to the family of Kantaben Patel, please visit our Tribute Store. "Email Address" would like to share the life celebration of Kantaben Patel. Click on the "link" to go to share a favorite memory or leave a condolence message for the family.